Howdy, y’all! It’s about time for the holidays, and you know what that means—plenty of free time for both you and the kids. Why not corral the group and head over to the High Museum of Art to partake in some rootin’ tootin’ family fun in Go West! Art of the American Frontier! In addition to a century of American art on display in Go West! our kids’ audio guide offers each child the opportunity to discover the Wild West with our narrator Abe the Eagle. The fun doesn’t stop there, though! 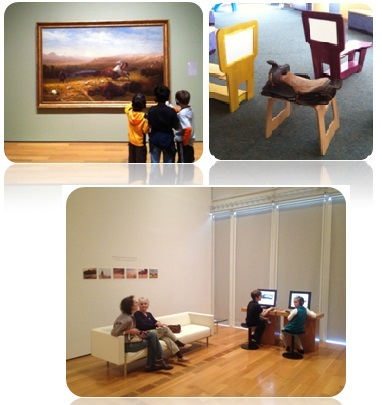 While you’re in the exhibition, saddle up to one of our computer stations to create your very own image of the American West using elements from paintings in the exhibition. Email your masterpiece home as a souvenir! The Greene Family Learning Gallery has the Western spirit with a Frederic Remington themed still-life activity to inspire your child’s creative side, while our Imagination Playground Blocks offer both kids and adults the opportunity to pioneer their architectural skills. On November 29, you and your family can explore what skills were needed to survive and thrive in the Wild West! The Homestead Atlanta brings artisans, crafters, makers and survivalists to demonstrate everything from canning to metalsmithing, hide tanning, and yarn spinning. Join us for mini workshops, lively music, and of course the exhibition that inspired it all, Go West! This program is free with museum admission. For those families or visitors who wish to purchase or gift a family membership, there’s no better time than now: when purchased before April 1st 2014, all Family Memberships include an exclusive tour of Go West! led by education staff at a time before the museum opens to the general public! So scoot your boots down now to the High Museum of Art to venture back in time to the frontier of the American West and discover just how fun the Museum can be for you and your family!